Marshall M. Fredericks Sculpture Museum | Sketch of site plan for "Nordic Swan and the Ugly Duckling (Hans Christian Andersen Fountain)"
Sketch of site plan for "Nordic Swan and the Ugly Duckling (Hans Christian Andersen Fountain)"
This sculpture represents Fredericks' interpretation of Hans Christian Andersen's popular story, The Ugly Duckling. Unlike Fredericks' portrayals of other literary subjects, this sculpture illustrates not one moment in the story, but two. Fredericks placed the unhappy duckling driven from place to place because of his ugliness at the base of the fountain. Located above is the beautiful swan he grew to be. Fredericks emphasized the difference between the young and mature bird. The earthbound duckling is awkward and heavy, with stubby wings and tail while the swan soars overhead in an open form which appears almost weightless. Fredericks originally conceived this sculpture for the Danish Village retirement home in Rochester Hills, Michigan. A bronze cast of this sculpture is located in Skælskor, Denmark where Hans Christian Andersen lived and penned “The Little Mermaid,” “The Ugly Duckling,” and many other children’s stories. 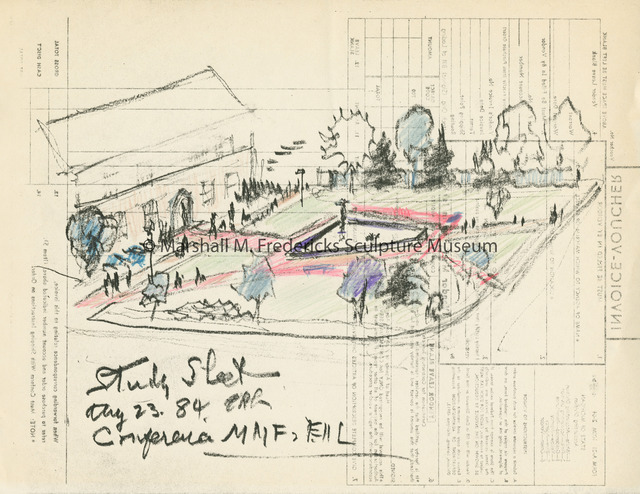 Fredericks, Marshall M., 1908-1998, “Sketch of site plan for "Nordic Swan and the Ugly Duckling (Hans Christian Andersen Fountain)",” Marshall M. Fredericks Sculpture Museum, accessed April 21, 2019, http://omeka.svsu.edu/items/show/7568.